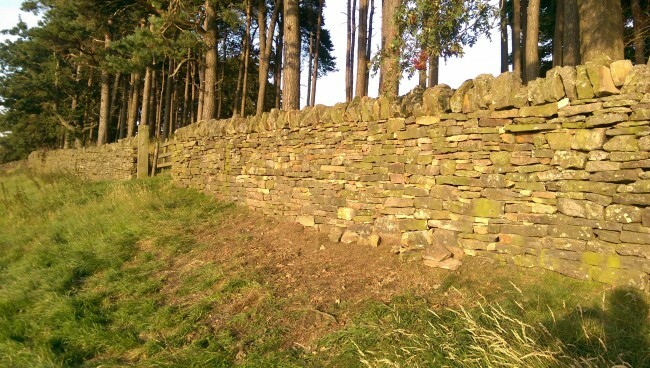 As luck would have it, a few days after discovering the collapsed dry stone wall in the woods we arranged with someone from the village to deal with the repairs. Barely a couple of days later they arrived and got all the repair work completed in around half a day! Given more time I’m sure I could have done the work myself (eventually) but it would have taken me days or even weeks because there are always many other jobs on my To-Do list. I’d been meaning to move the pigs to an electric fenced pen close to this area and that meant I couldn’t really afford to wait too long to get the wall fixed. I’m really pleased with the results and I’ll happily admit that it looks better than anything I could have done. Our neighbour is probably also happy because his sheep can go back in the adjoining field.